Most of these medals are blended with metal, that was flown in Space! Some were even entirely flown in space! 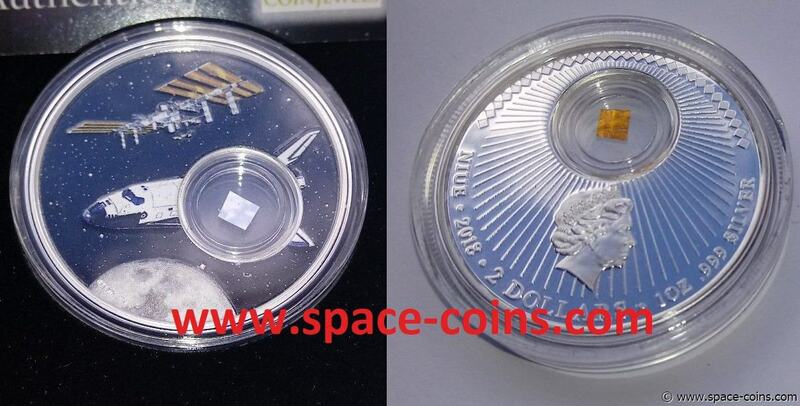 First ever coin to contain SPACE FLOWN material! !! ONLY 500 coins issued !! 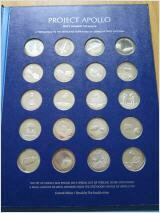 Mintage - only 500 pieces! 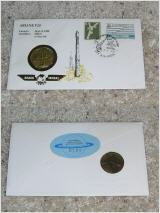 Including capsule, wooden box and numbered certificate! 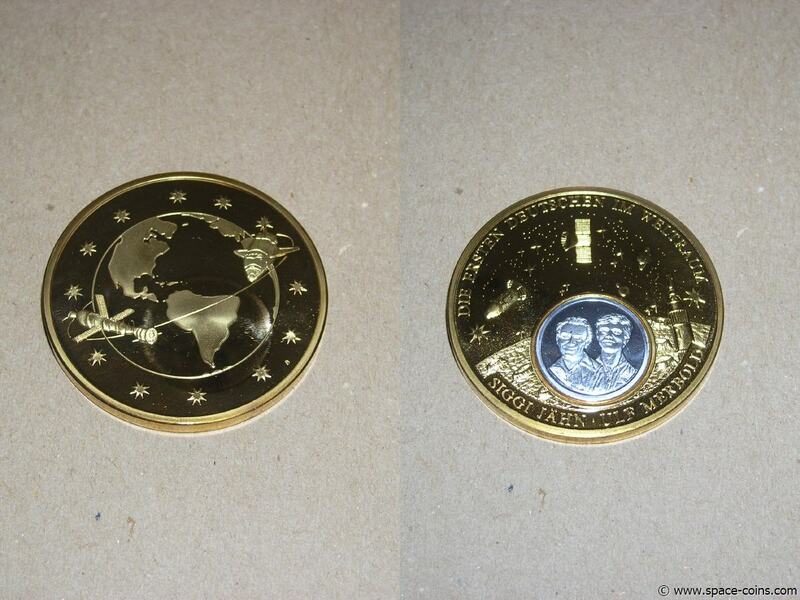 The inserted capsule at the center of the coin contains flown material from all six Space Shuttles! 2-piece SET! With matching serial numbers! Space Shuttle medal with VISIBLE flown material from all 6 Space Shuttle! 2,5" (63 mm) in diameter! 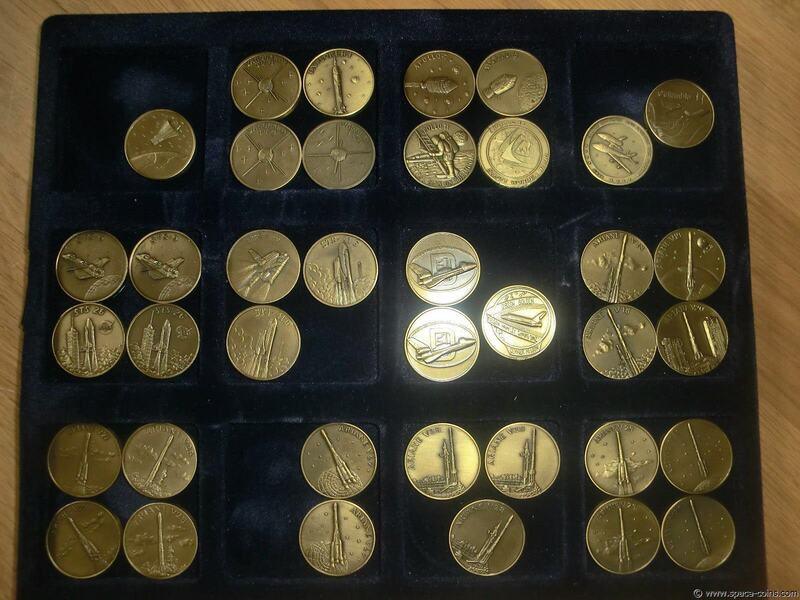 Serialized, ONLY 981 medals issued! 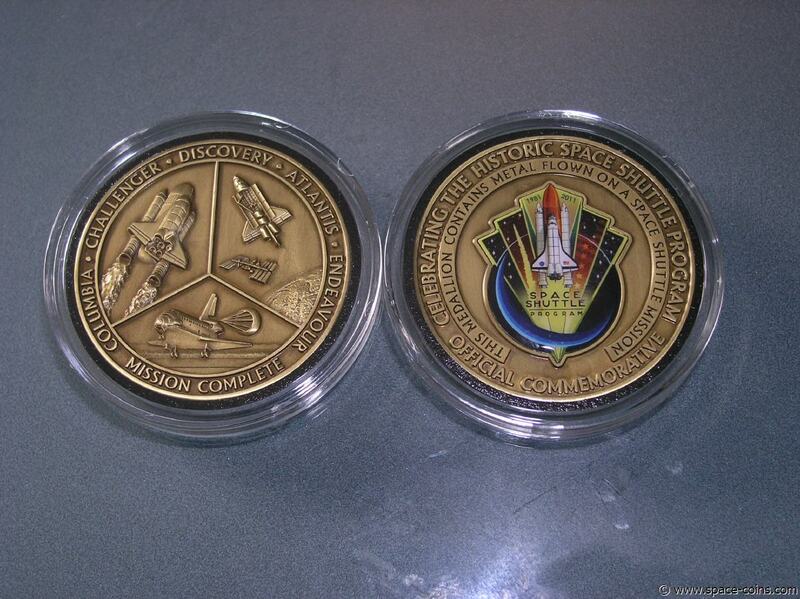 The first ever medal that contains flown material from all six Space Shuttle in ONE medal! 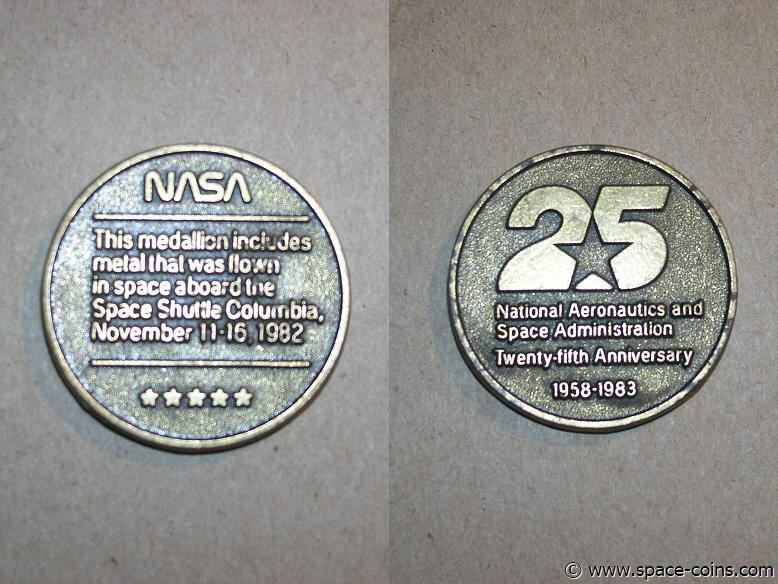 The flown material isn't simply melted into the medal but you can actually see it! 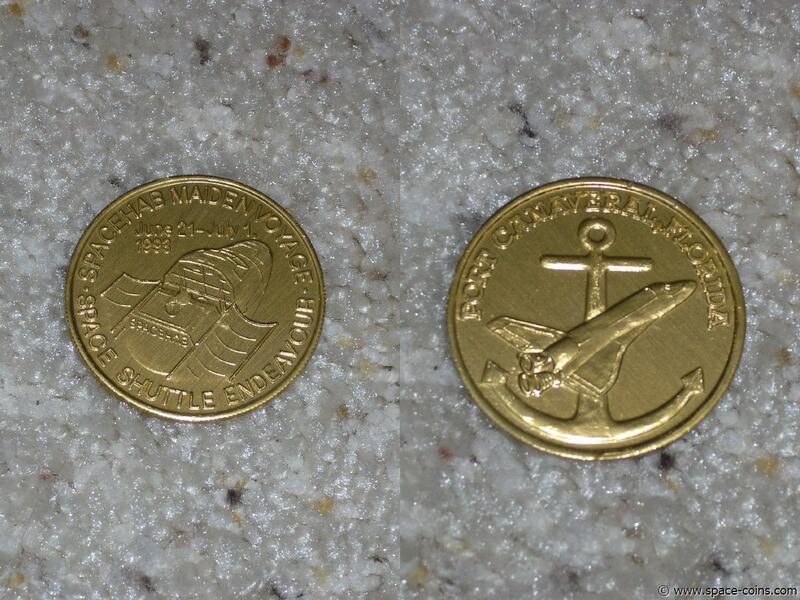 -it has a matching legal tender coin (2012 Cook Islands, $1 Space Shuttle coin)! -it has the biggest ever size of any medal with flown material - 2.5" in diameter (63mm), 5mm thick and it weighs 2.6oz (75 grams)! Quality product made exclusively for www.space-coins.com by WINCO INTERNATIONAL (WINCO produces many of the official NASA medals with flown metals). Including capsule, display stand and certificate of authenticity! 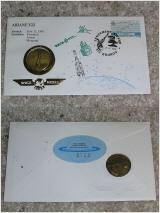 Including capsule and certificate of authenticity! TWO MEDALS! If you want to display both sides! 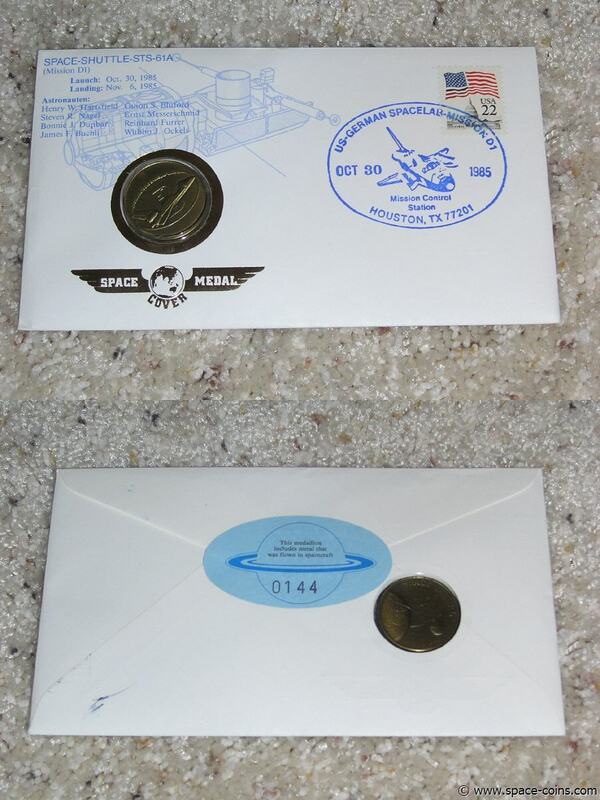 (2) Space Shuttle medals with VISIBLE flown material from all 6 Space Shuttle! 2.6 oz (75 grams) each! 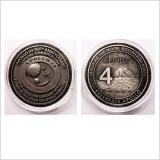 Including capsules and certificates of authenticity! 3-piece SET! With matching serial numbers! Mintage - only 981 pieces! 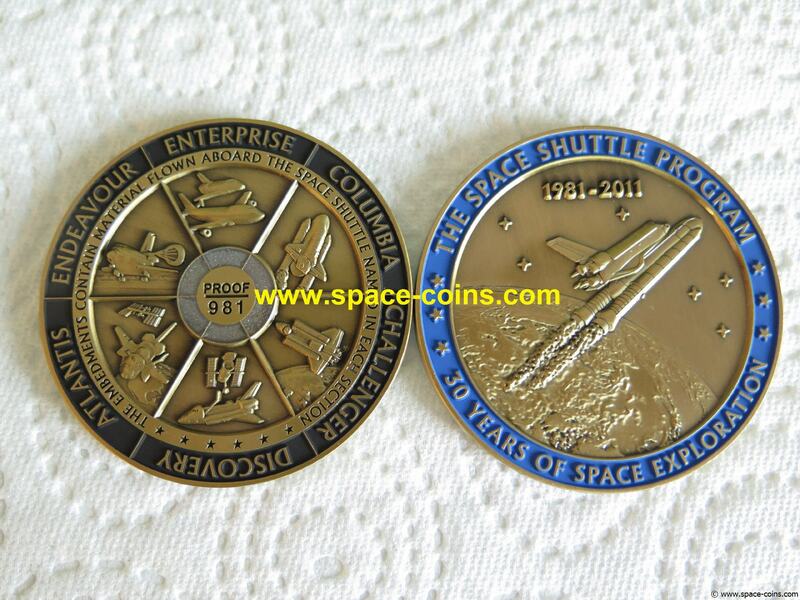 Contains ONE Space Shuttle flown material medaillon and ONE legal tender Space Shuttle $1 coin! 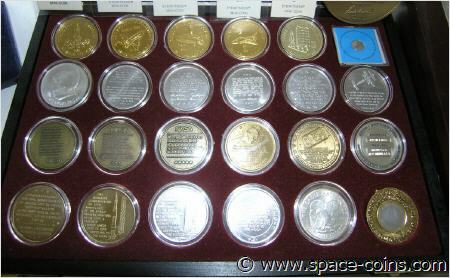 Space Shuttle medals with VISIBLE flown material from all 6 Space Shuttle! !! ONLY 981 coins issued !! 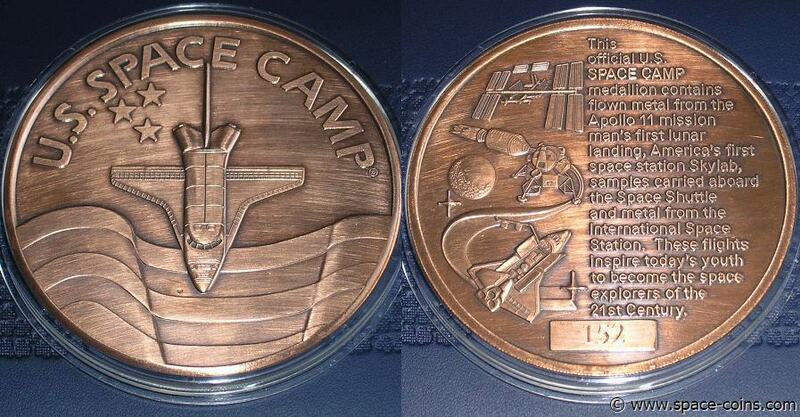 "This official U.S. Space Camp medallion contains flown metal from the Apollo 11 mission man's first lunar landing, America's first space station, Skylab, samples carried aboard the Space Shuttle and metal from the International Space Station. 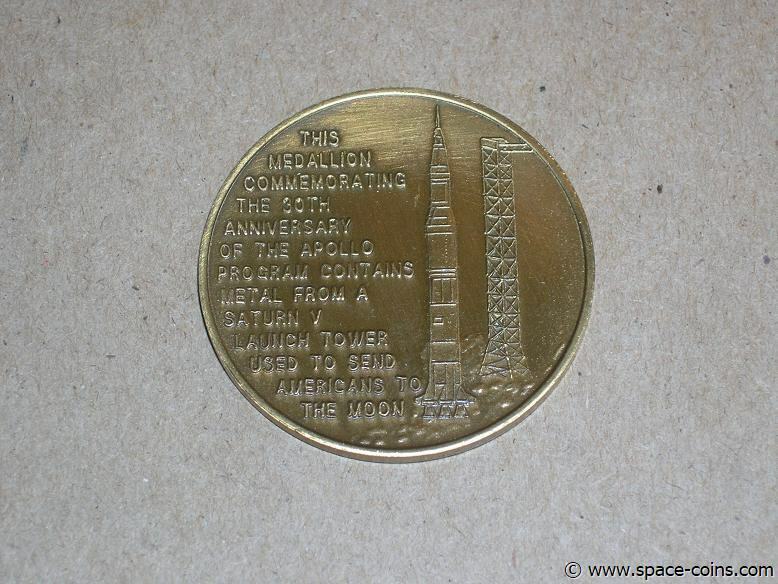 These flights inspire today's youth to become the space explorers of the 21st Century"
"This medallion commemorating the 30th anniversary of the Apollo Program contains metal from a Saturn V launch tower used to send Americans to the Moon." 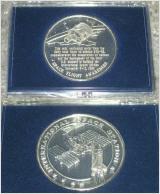 Medal with flown Gemini 4 material, Limited Edition, only 3500 made! 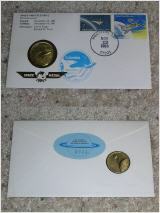 Minted with flown metal from the Gemini 4 capsule. 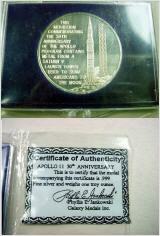 Certificate of Authenticity and medallion display stand included. 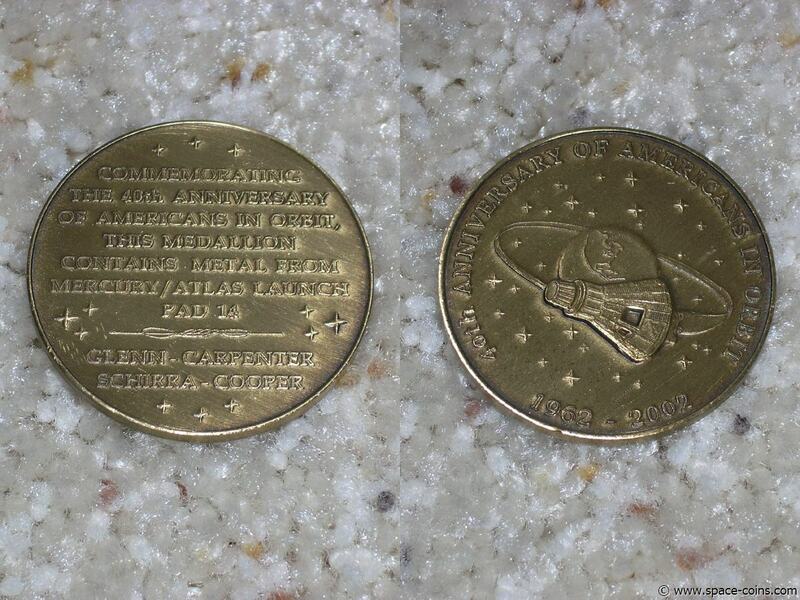 "Commemorating the 40th Anniversary of Americans in orbit, this medallion contains metal from Mercury Atlas launch pad 14." "This medallion contains material from Viking which landed on Mars July 20, 1976"
"This medallion contains metal that traveled through space on the world's first space station -- the U.S. Skylab -- on which astronauts Conrad, Kerwin, Weitz, Bean, Garriott, Lousma, Carr, Gibson and Pogue opened a new era in the uses of space"
A real piece (approx. 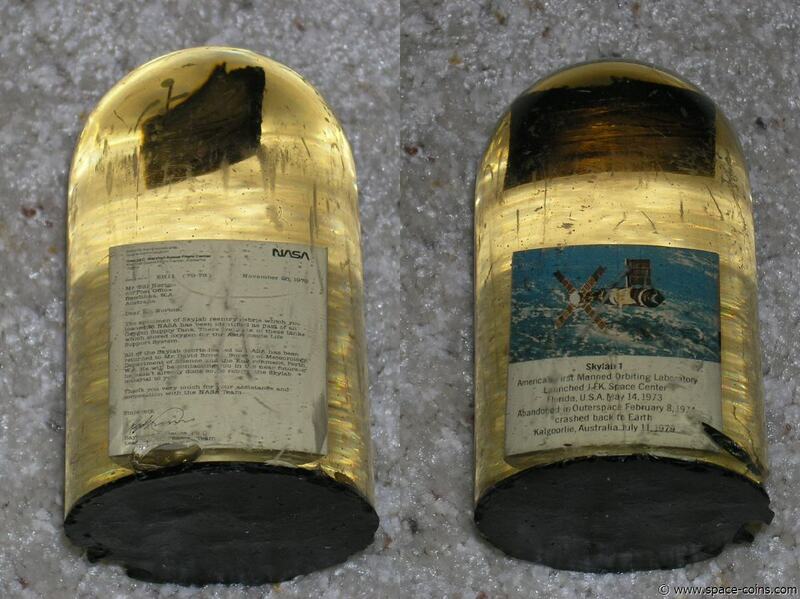 1½"x1" in) of recovered flown Skylab material in lucite! The lucite cylinder is 4"x2½" in size, due to the age the lucite shows signs of scratching, yellowing and chipping. 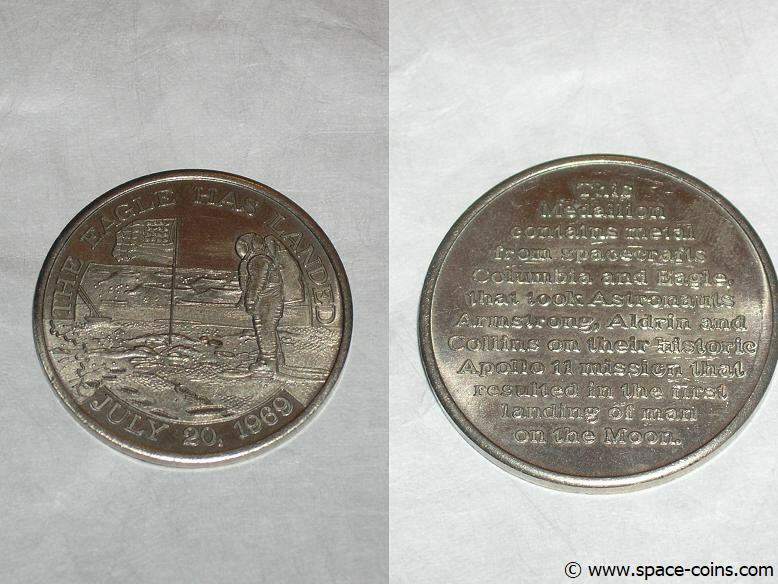 "This commemorative medallion contains metal flown on Neurolab, the sixteenth pressurized module flight in the fifteenth year history of Spacelab human space operations, April 13-May 3, 1998". Only 5,592 medals produced ! Very rare 1oz silver version! On July 16th 1969, Neil Armstrong became the first man to walk on the moon. 15 years after that monumental event, the Statue of Liberty underwent a full restoration to ensure the preservation of the World famous landmark. During this groundbreaking restorative project, using actual copper removed from the statue, two 15-inch replicas were carefully molded and taken on board the April 1985 flight of the space shuttle Discovery. 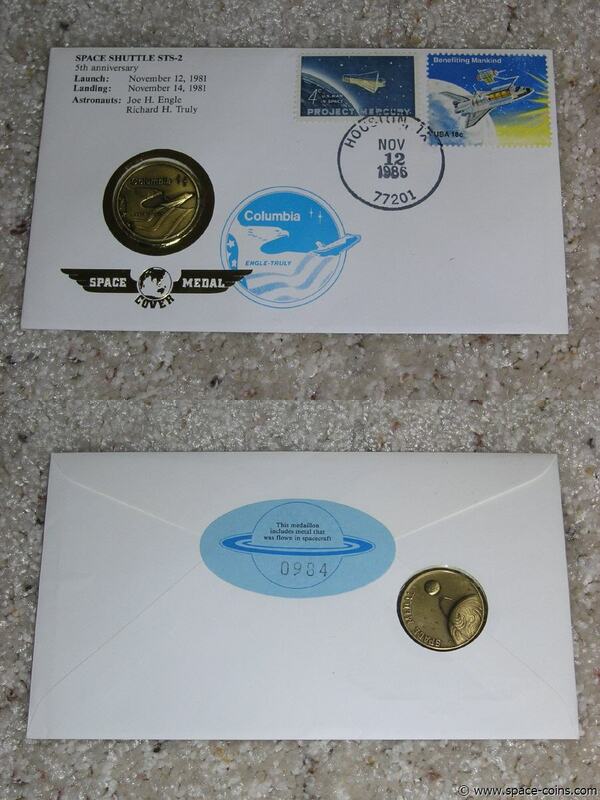 Upon the shuttle’s return from space, one replica was put on display at the Statue of Liberty and the other was melted to create liberty centennial seals. 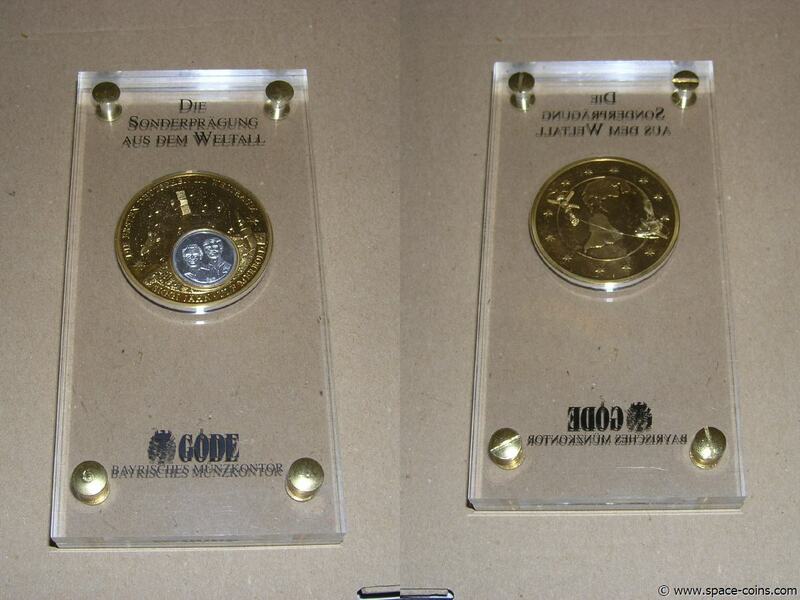 Pieces of these seals were placed into these limited edition coins. 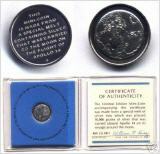 “This Medallion contains metal flown to the moon on Apollo missions"
The medallion is minted in part from command module. As it was created to honor all the Apollo missions, NASA has said that the spacecraft from which the metal was taken for the medallion will not be disclosed. The medallion is minted in part from command module. As it was created to honor all the Apollo missions, NASA has said that the spacecraft from which the metal was taken for the medallion will not be disclosed. 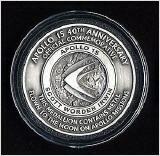 "This medallion contains metal from the Apollo 7 spacecraft flown by Wally Schirra, Donn Eisele and Walt Cunningham. October 11-22, 1968." "In appreciation for your contribution to the Apollo Saturn project the Apollo 8 crew carried metal in this medallion on man's first flight to the Moon"
Apollo 8 (2) with certificate! 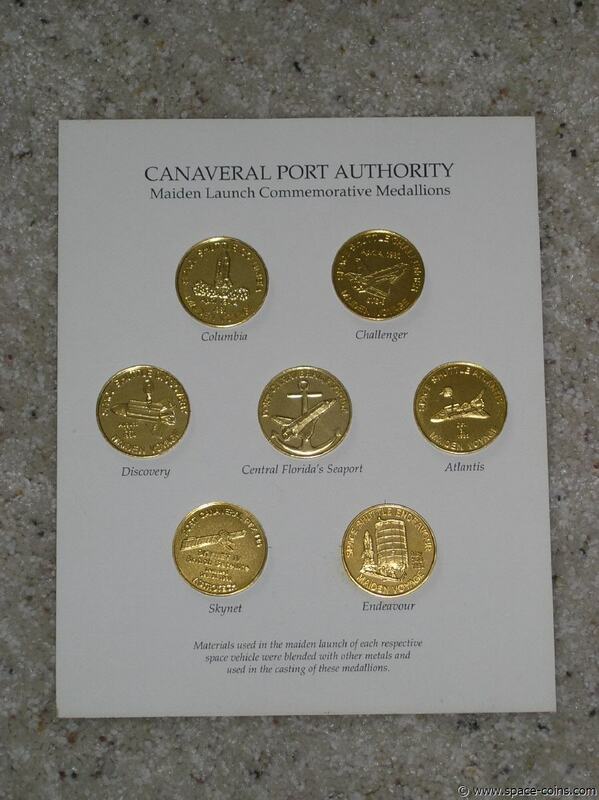 "This 50th Anniversary medallion contains metal from most of the aircraft Eastern has flown since the Pitcairn Mailwing and from the Apollo 8 spacecraft as well....."
Apollo 11 MFA GOLD medal! VIP EDITION! 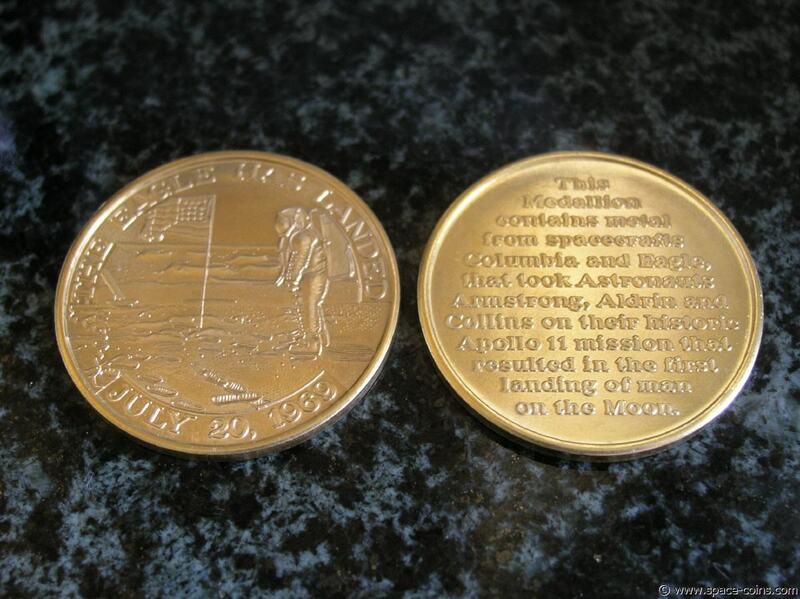 The coin bears an artist’s rendition of Neil Armstrong standing on the lunar surface with the American flag. 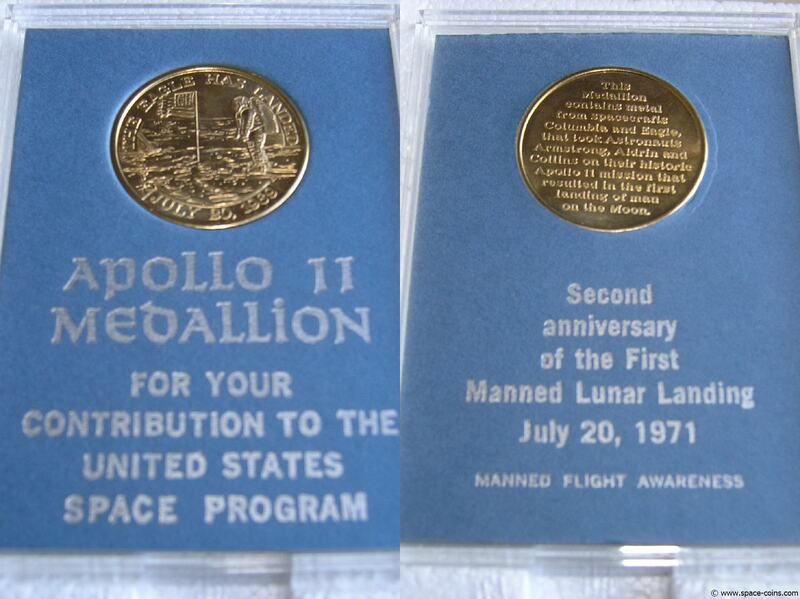 Apollo 11 MFA GOLD medal! VIP EDITION! Including original case! The cardboard color might be blue (like pictured) or white. 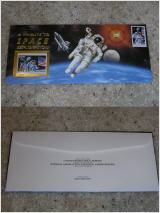 Comes with hand signed certificate from Astronaut Paul Weitz! 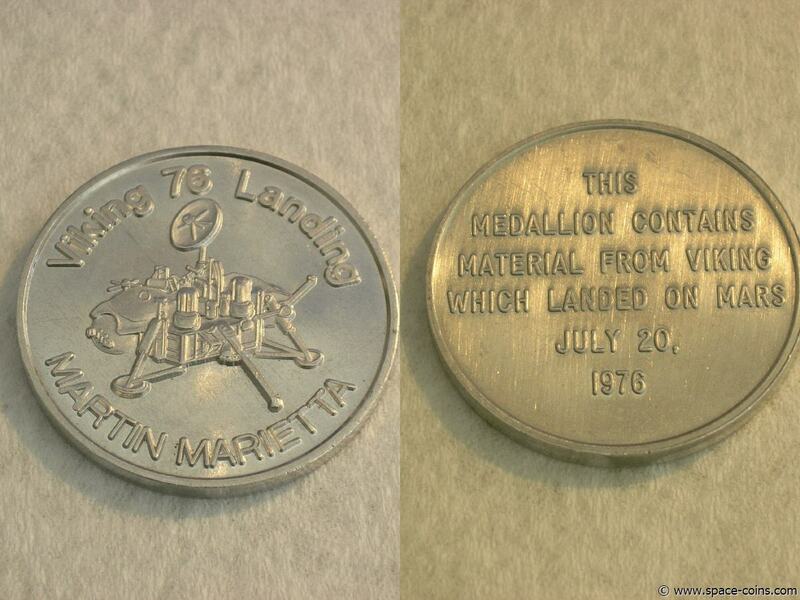 The actual metal from The Eagle, the Apollo 11 landing module, was used in the processing of this medallion, which was produced as a very Limited-Edition historical commemorative in celebration of the historic moon landing. THIS IS THE VERY RARE GOLD PLATED EDITION! 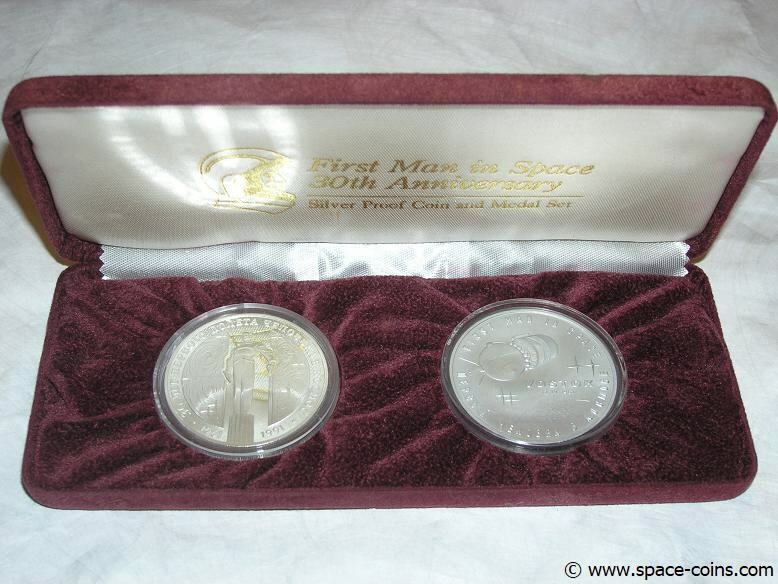 "Contains Metal Flown To Lunar Orbit On Apollo 12"
Limited Edition, Solid Sterling Silver, each medal 31mm diameter (the set contains 9 troy ounces of silver). A total of only 4967 sets were issued. Including COA, dated 1972, and blue binder. 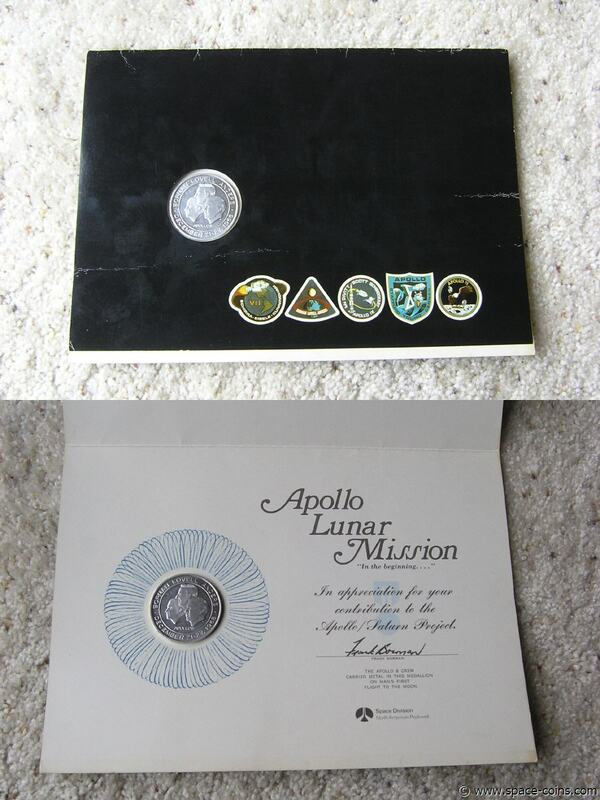 This set of medals was struck on a special lot of sterling silver containing a small amount of metal returned from the epic moon voyage of Apollo XIII. 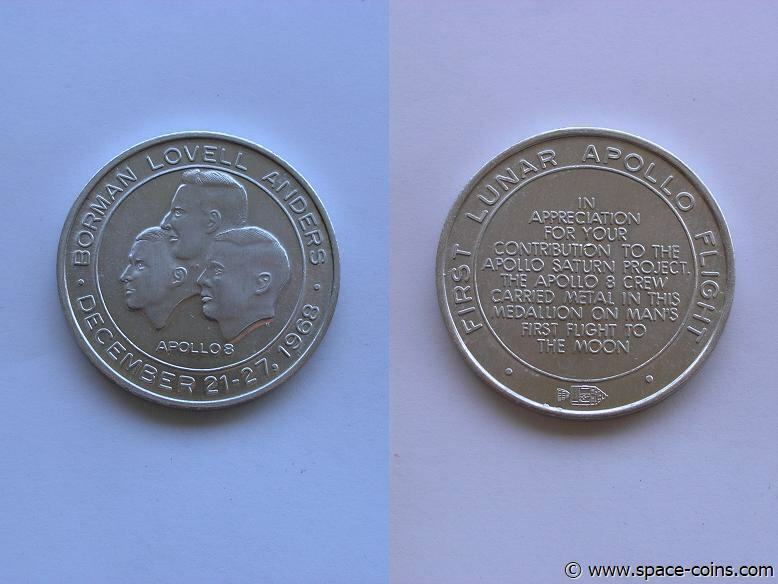 The medals were issued in commemoration of the Project Apollo moon mission, and minted in 1970, the year following the first moon landing. 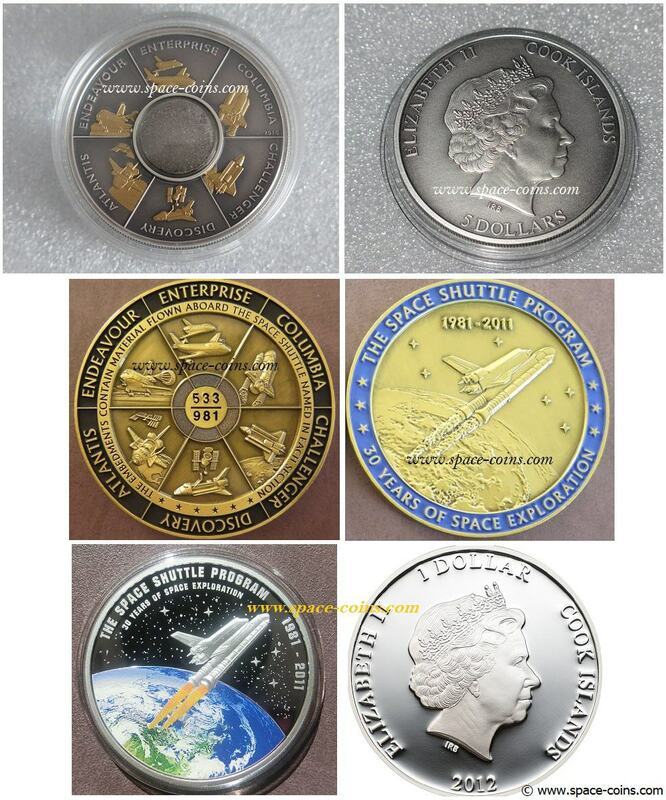 Some of these medals were claimed to have been "flown", i.e., that they were taken into space, and that generated some controversy. 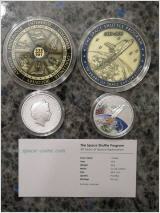 According to the Franklin Mint, 4967 sets of the medals were issued that were thought to have contained silver that was carried around the moon. Upon learning that this was incorrect, the Mint recalled those sets and replaced them with sets that were minted from a special lot of silver that did contain metal that was flown around the moon. According to the Mint, 3698 of the sets were replaced. This is the very rare ERROR set! One of the only 1269 sets that were not replaced. 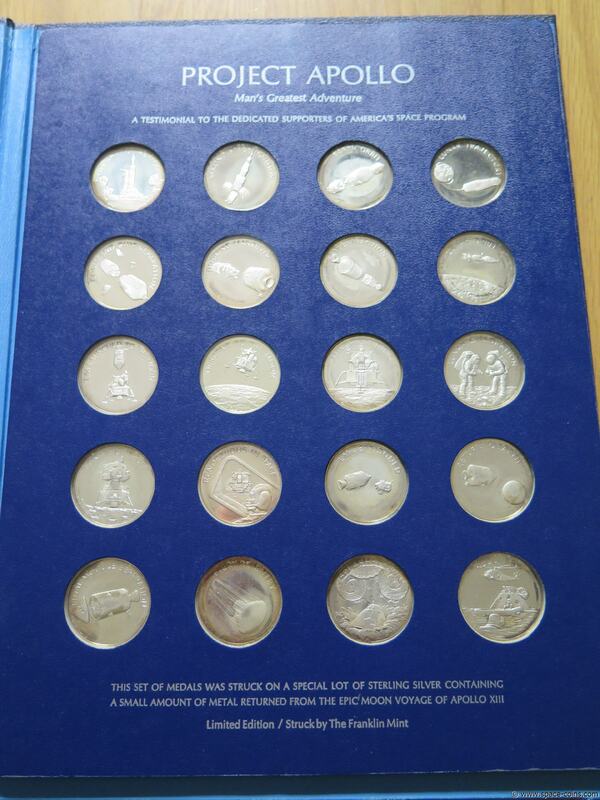 So it does not contain the flown silver but it is much harder to find. Including COA, dated 1970 and blue binder. Franklin Mint Silver Apollo 13 Medal - only 7.507 made! Limited Edition - only 7.507 made! 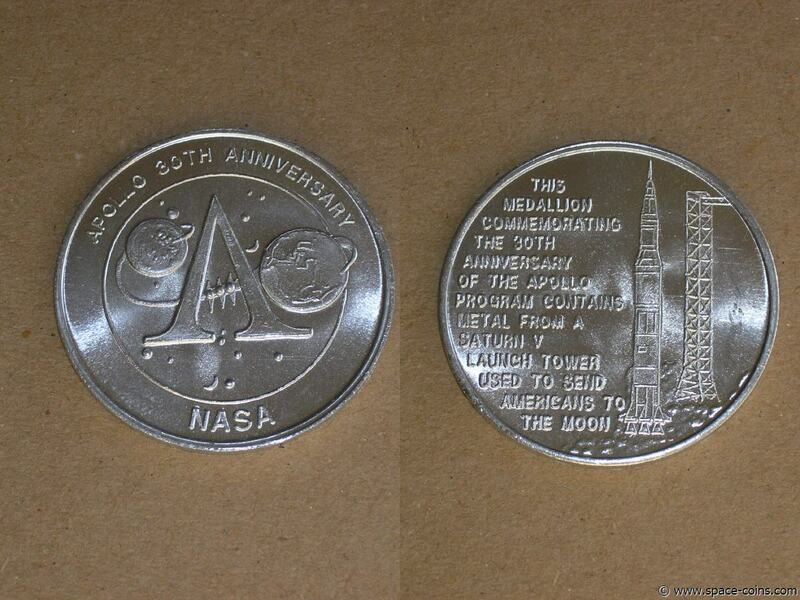 "This mini coin is made from a special melt containing silver that was carried to the moon on the flight of Apollo 14." "Contains Metal That Was Flown To The Lunar Surface"
"This medallion contains metal from both Apollo and Soyuz that joined together in the first International manned space mission on July 15-24, 1975"
Apollo-Soyuz (2) With original Apollo-Soyuz Award! PROOF/Sample Version, less than 50 of these were made! Including capsule and display stand! 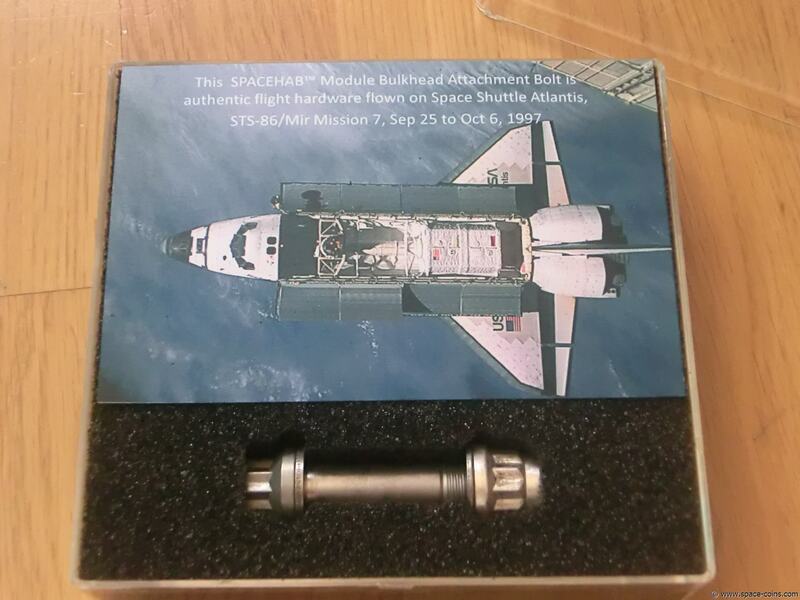 "Thank you for your contribution toward making the world's first orbital flight of the Space Shuttle STS-1 possible. We would like you to have this memento made, in part, of metal taken from the Columbia"
"This medallion was made in part from metal that was flown in space aboard the Space Shuttle Columbia, March 22-30, 1982"
"This medallion includes metal that was flown in space aboard the Space Shuttle Columbia, November 11-16, 1982." "Thank you for your contribution toward making the Approach and Landing Tests of the Space Shuttle Orbiter successful. 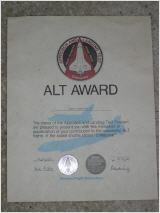 We would like you to have this memento made, in part, of metal taken from the Enterprise"
Space Shuttle Enterprise ALT (2) With original ALT Award! 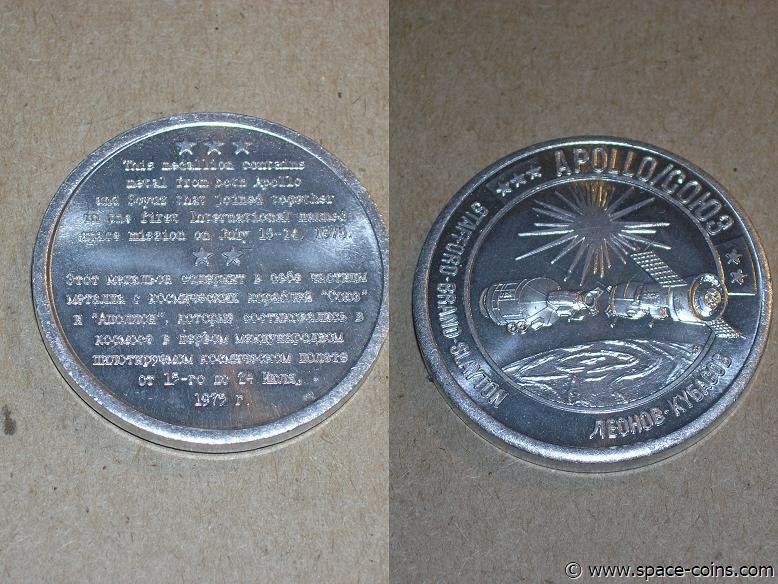 "This medallion commemorating international cooperation in space contains metal from the U.S. Space Shuttle Atlantis and the Russian Space Station Mir." Actually space flown bolt / nuts / washer! It was flown on the STS-79 Mission! The flown screw is about 6,5 cm (2.6") long and weighs 95 gram (3oz)! It was flown on the STS-86 Mission! 1 oz SILVER VERSION! VERY RARE! Still sealed in plastic case, including COA! 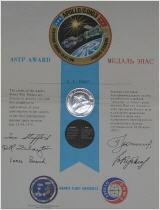 "This coin, containing medal from the Unity node flown on mission STS-88, commemorates the cooperation of nations and the deployment of the first U.S. element in building the International Space Station December 4-15, 1998"
"A portion of the metal used in the creation of this medallion was flown aboard the Space Shuttle Endeavour on the STS-89 mission which docked with the Russian Space Station Mir." 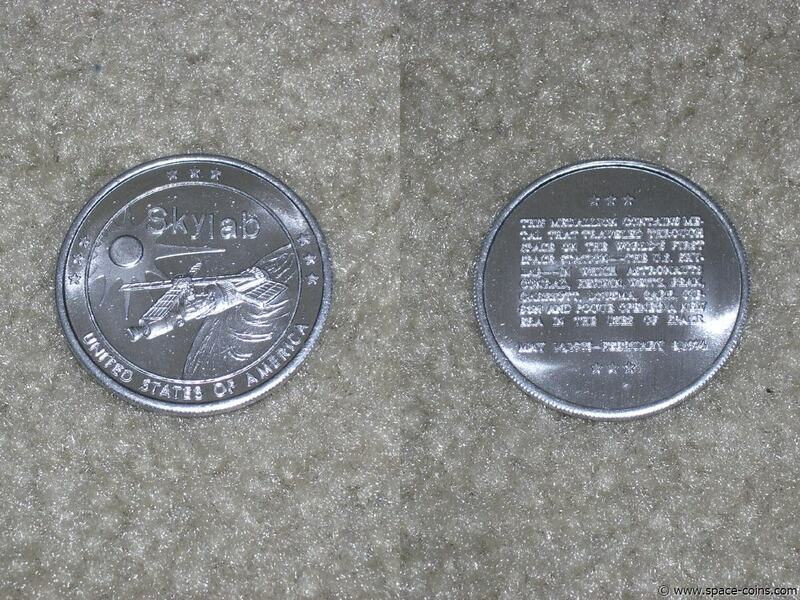 "This coin, containing metal from the U.S. 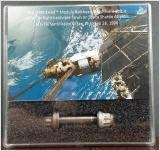 Laboratory module flown on mission STS-98, commemorates the deployment of another element in building the International Space Station February 2001." Not available to the public!! Only 1055 medals produced so far ! 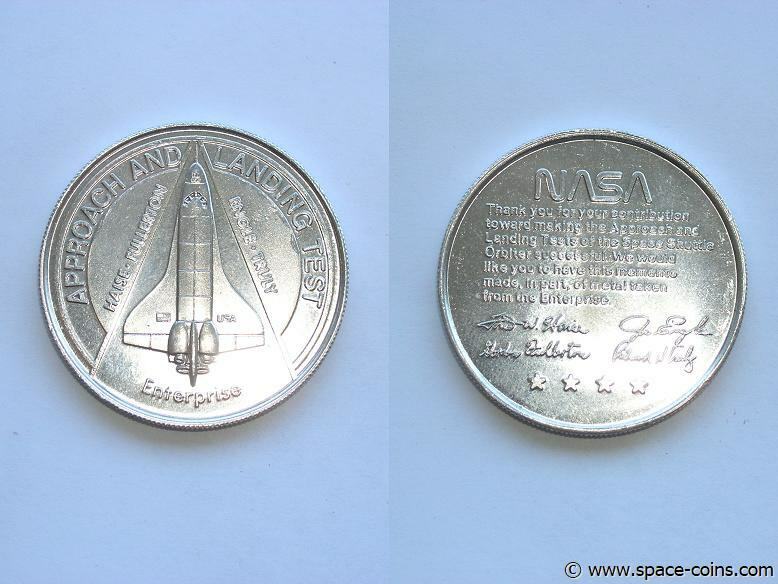 "This coin contains metal flown aboard the Space Shuttle Discovery, STS-114, July 26 - August 9, 2005"
Medal, made from Space Shuttle Columbia Maiden Voyage! 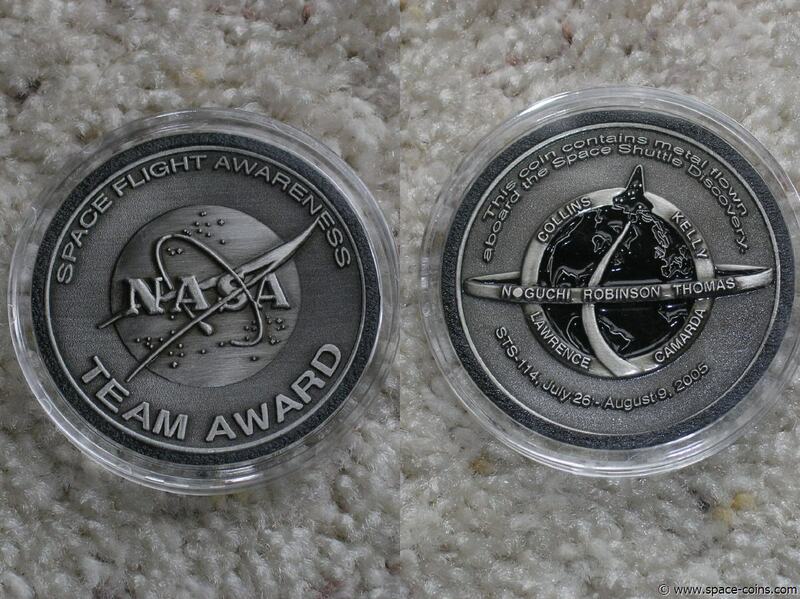 "This medallion is made with metal from Space Shuttle Columbia. 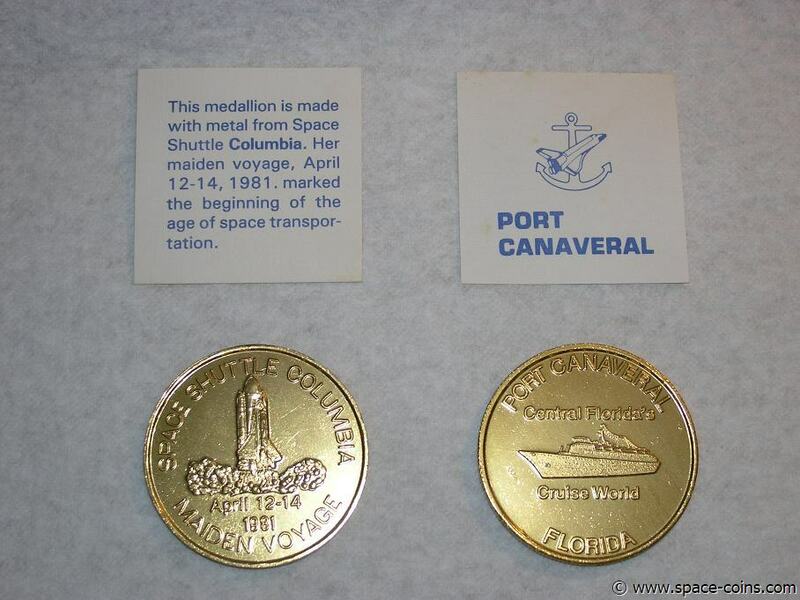 Her maiden voyage, April 12-14, 1981, marked the beginning of the age of space transporation"
Medal, made from Space Shuttle Discovery Maiden Voyage! "This medallion is made of metal blended with materials used in the first launch of Space Shuttle Discovery August 30-September 5, 1984. 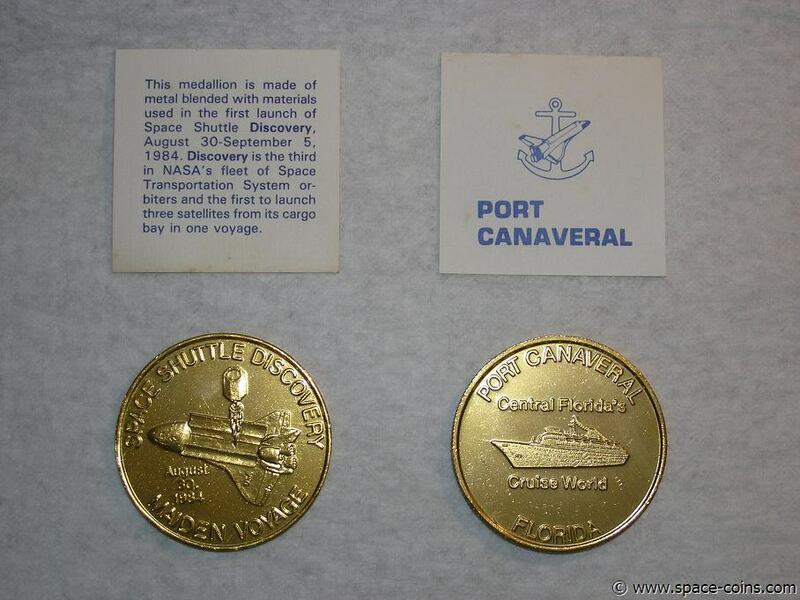 Discovery is the third in NASA's fleet of Space Transportation System orbiters and the first to launch three satellites from its cargo bay in one voyage"
Medal, made from Space Shuttle Challenger Maiden Voyage! 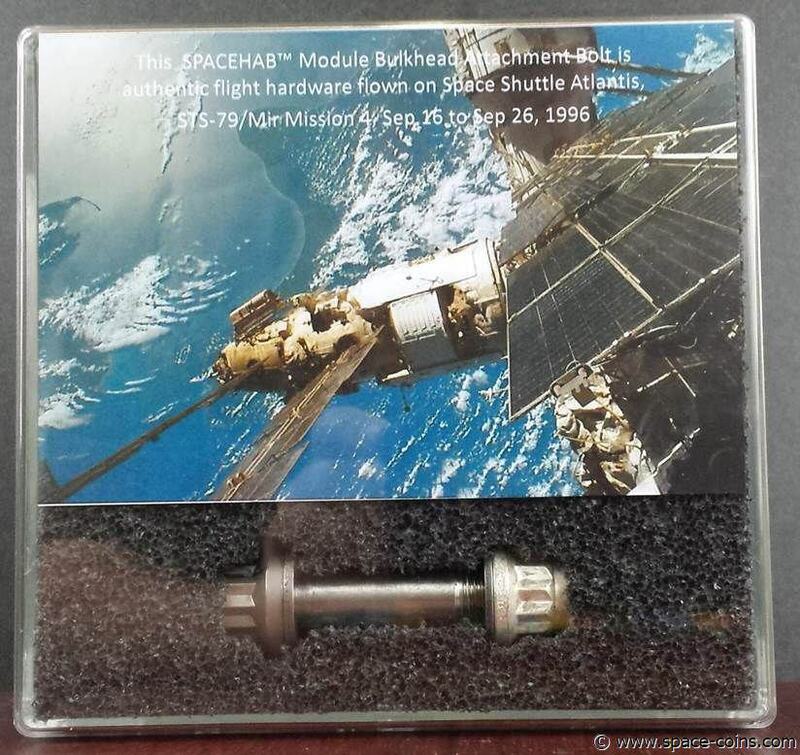 "This made of metal blended with material expended in the first launch of Space Shuttle Challenger April 4-9, 1983. 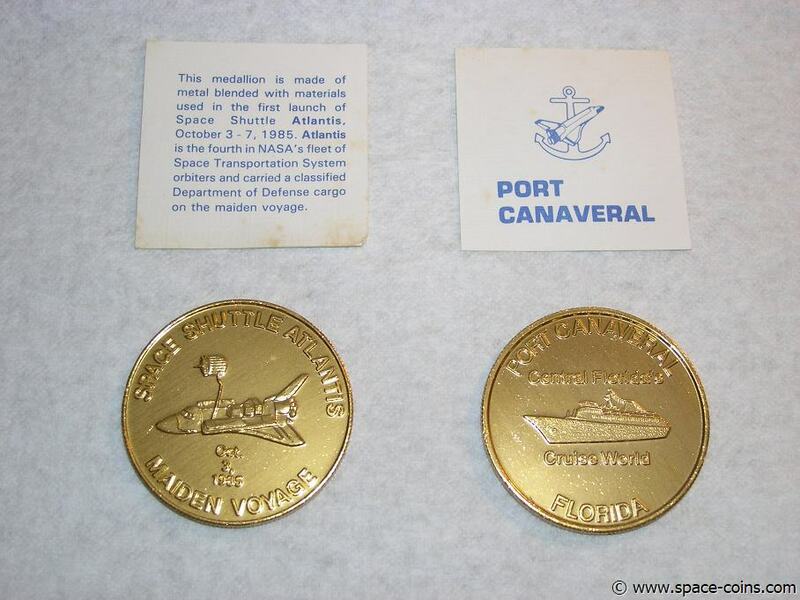 With this voyage the U.S. space fleet was doubled"
Medal, made from Space Shuttle Atlantis Maiden Voyage! 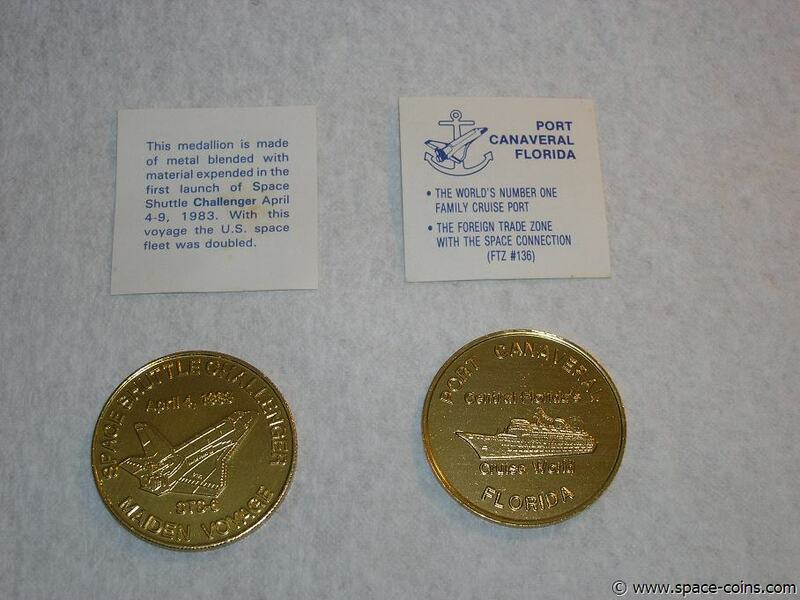 "This medallion is made of metal blended with materials used in the first launch of Space Shuttle Atlantis, October 3-7 1985. Atlantis is the fourth in NASA's fleet of Space Transporation System orbiters and carried a classified Department of Defense cargo on the maiden voyage"
Medal, made from Space Shuttle Endeavour Maiden Voyage! Medal, made from Skynet Material! Medal, made from Spacehab Material! 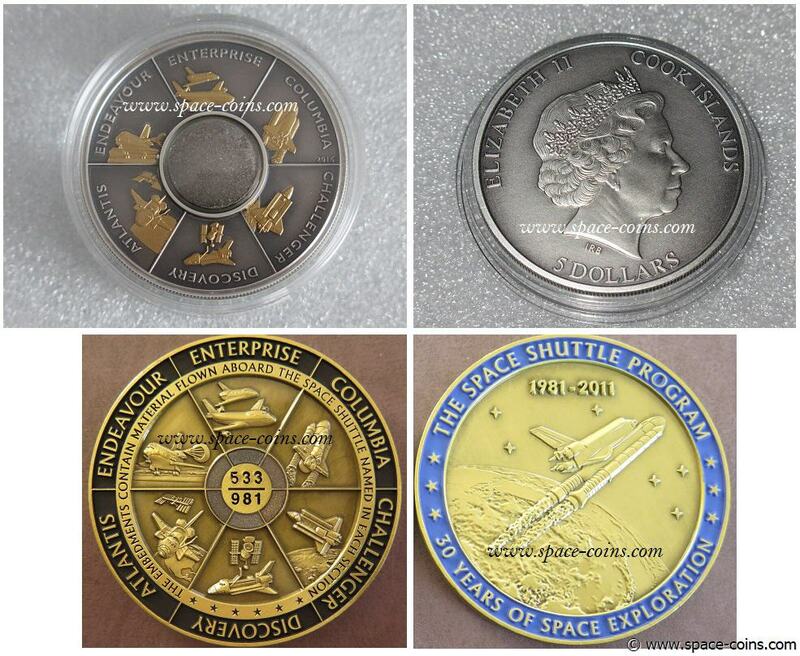 7 space coins made from materials used in the maiden launch of each respective space vehicle. That material was blended with other metals and used in the casting of these medallions. 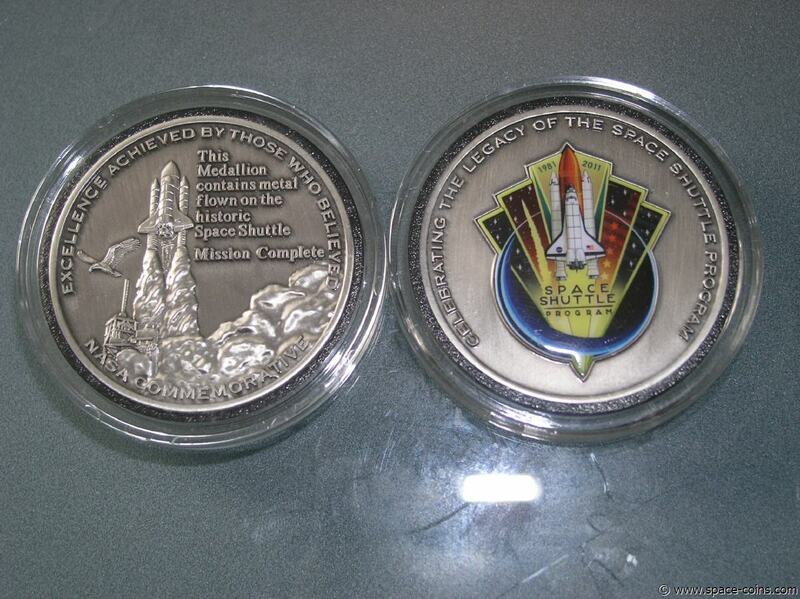 "This Medallion contains metal flown on a space shuttle mission"
"This Medallion contains metal flown on the historic space shuttle"
"Commemorating the first Ares I-X launch, America’s first small step to returning to the Moon and beyond. 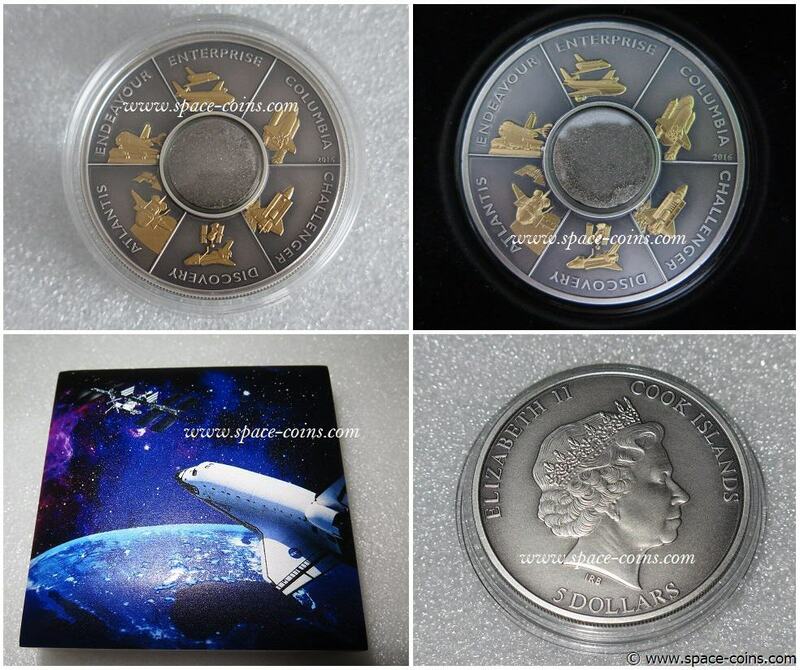 In recocnition of the roots of ares, this coin contains FLOWN METAL from the Apollo 11 spacecraft COLUMBIA and EAGLE and also contains metal from the original SATURN V pad, from which Ares was launched." 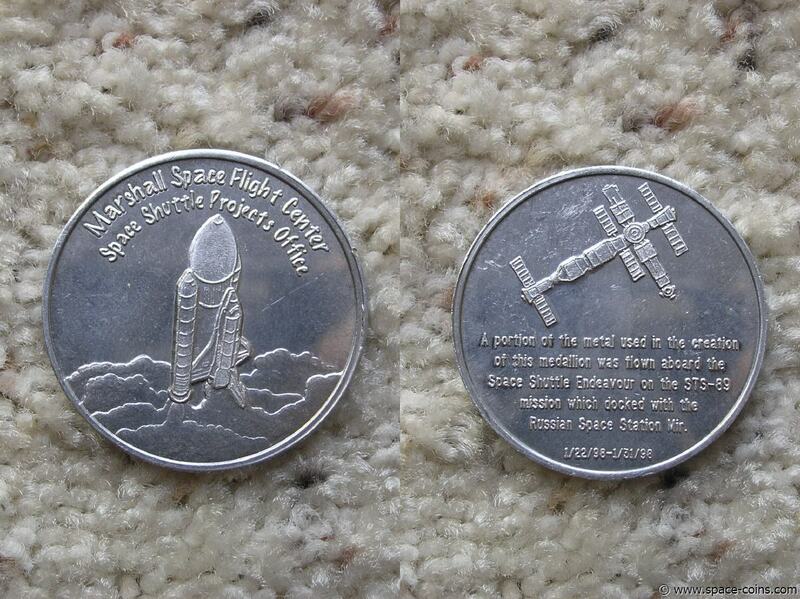 Actually SPACE FLOWN medal! Saturn V, Apollo 11, Werner von Braun! 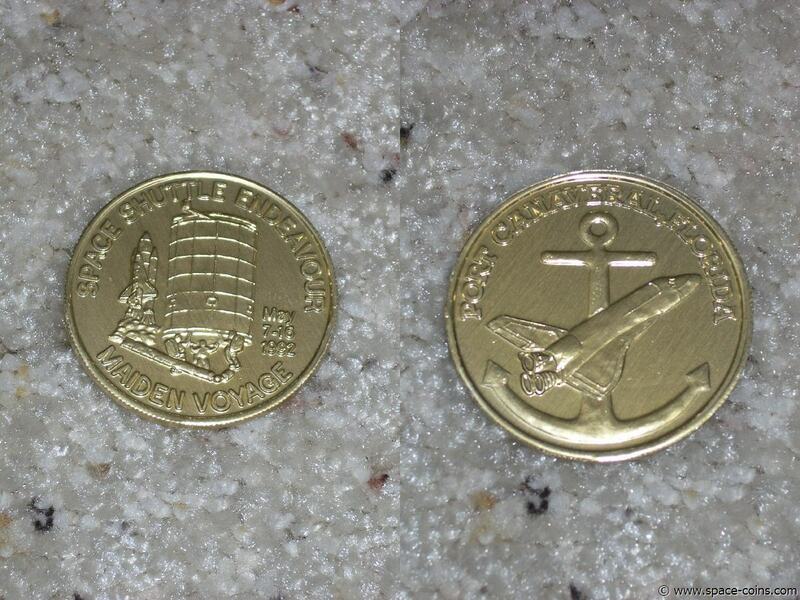 This gold plated medal (2" diameter, 50 grams) comes with an inlay medal that was flown in space for 17 days on the Foton-9 russian space craft. Launch was on June 14th 1994. Landing on July 2nd 1994. 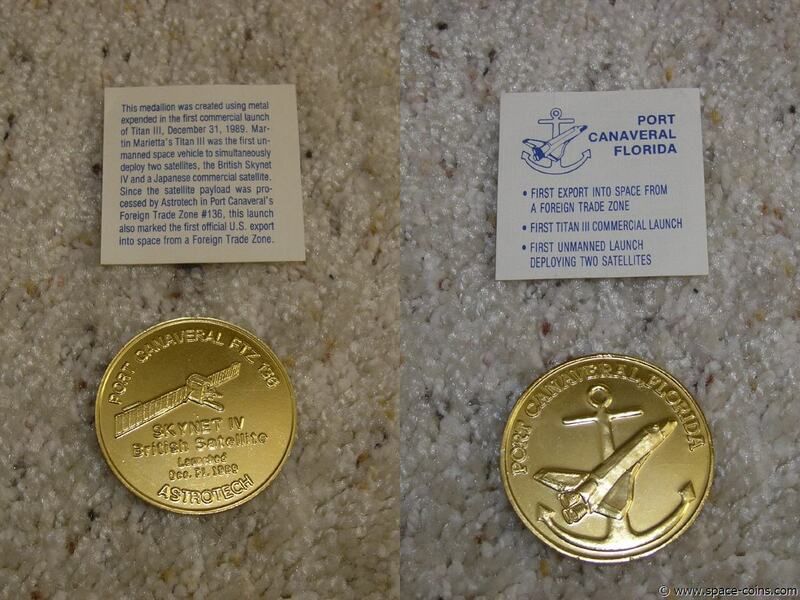 The medal actually flew around the earth 279 times! 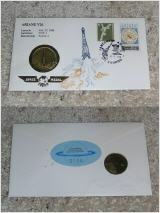 Comes with copy of german COA - only 3.940 made! 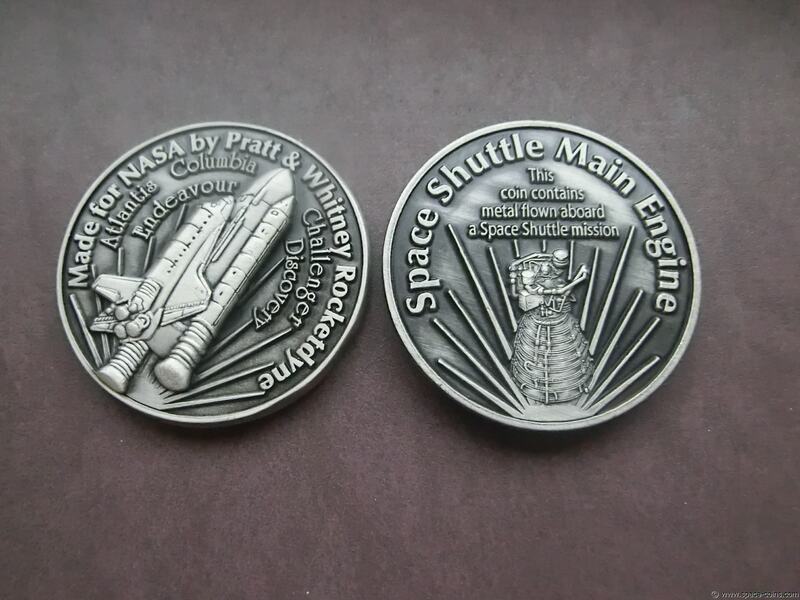 Medal, made from Shuttle BURAN material! Only 1000 made! 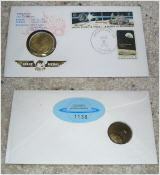 Minted entirely from metal taken from the Soviet shuttle BURAN (the melt was taken primarily from instrument braces removed shortly after the Buran's first and only flight). Only 1.000 of those medals were made!! 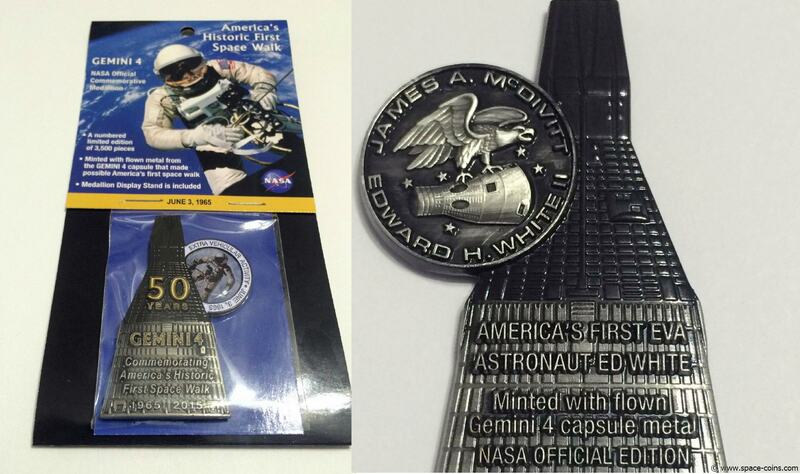 One Medal is made of pure Silver (1 oz) the other one contains flown material. 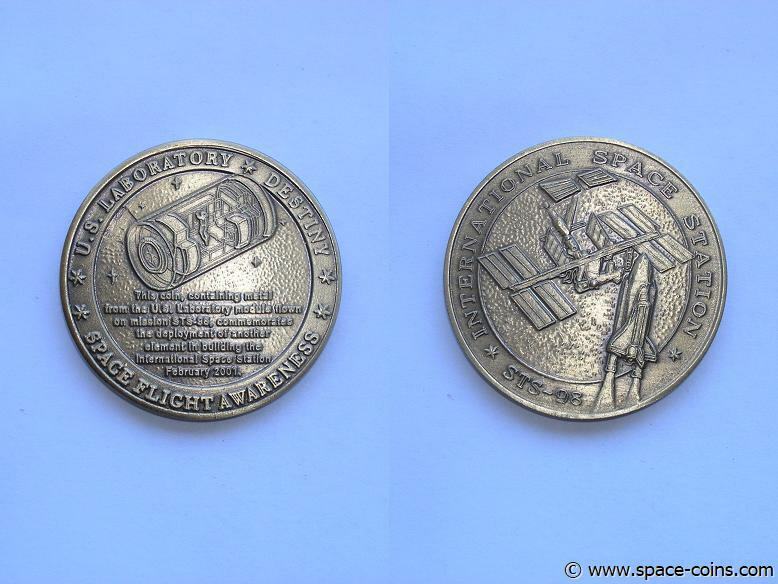 First Man in Space 30th Anniversary Medal issued by the Baikonur Cosmodrome, USSR on April 12, 1991, the exact 30th anniversary flight aboard Vostok I. 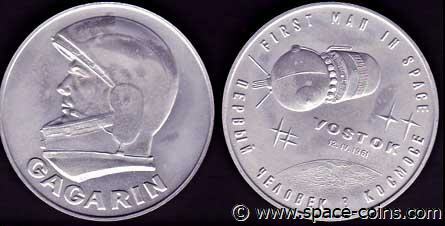 The medal bears the profile of Yuri Gargarin, the first man to travel in space. 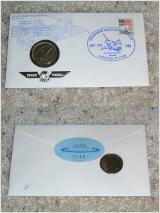 The Vostok I is pictured on the reverse. 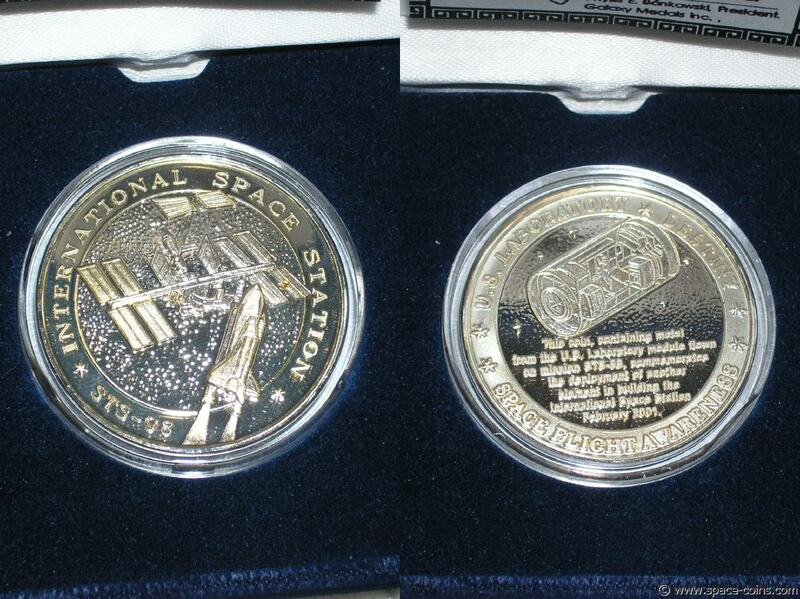 This is a beautiful medal and is minted from the metal of a Soviet space craft actually flown into space. 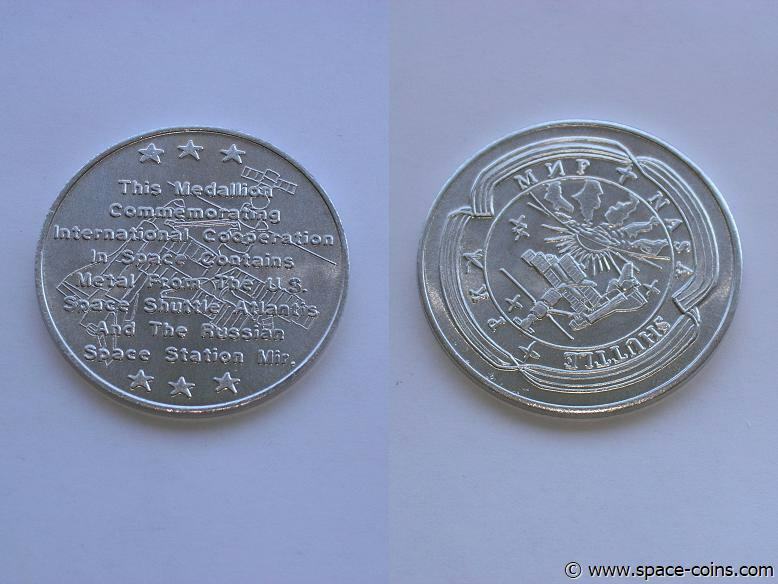 This is a beautiful medal and is minted from the metal of a Soviet space craft actually flown into space. It is 1 1/2 inches in diameter and in great condition!! 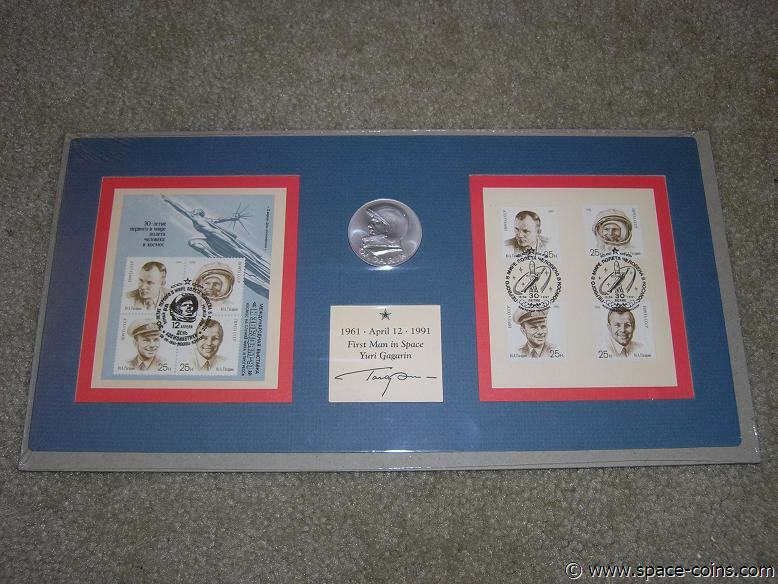 This set also includes 2 x 4 Gagarin stamps. 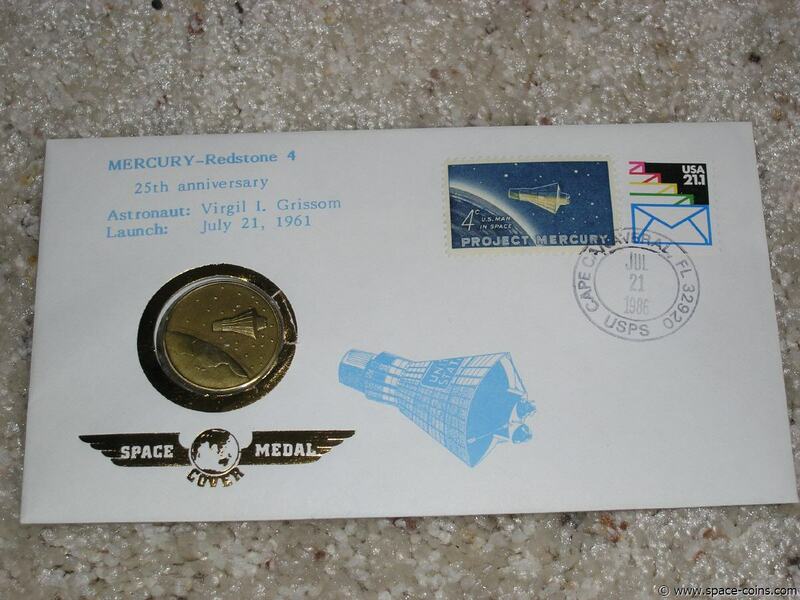 Space Medal Cover, Mercury/Redstone 4 Mission! Very rare! Limited Edition - Only 2,000 produced! 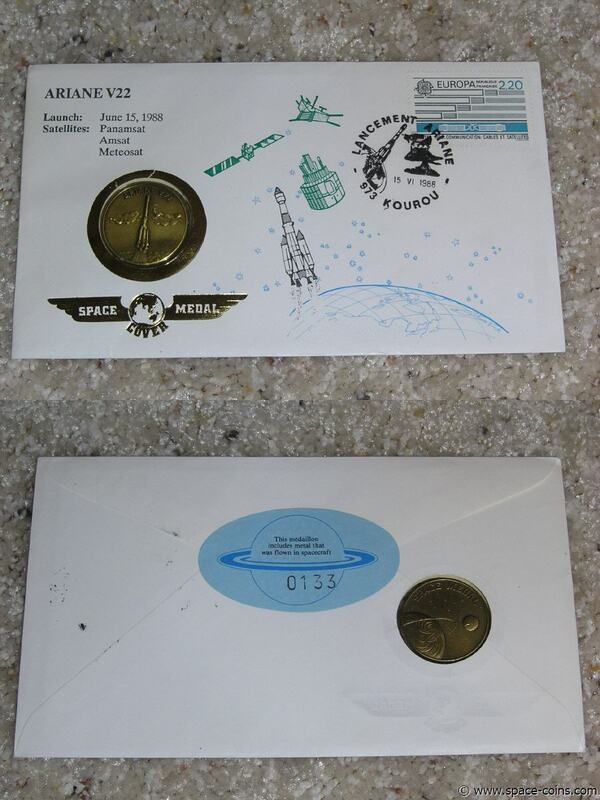 Cover with a space medal which contains space flown material! 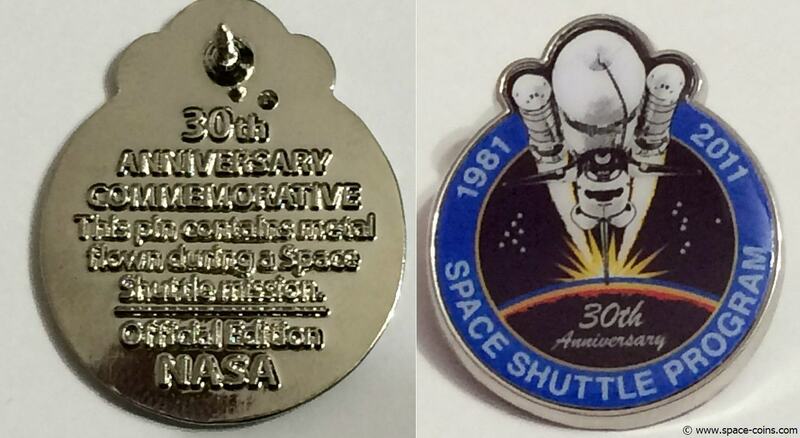 "This Medaillon includes Metal that was flown in spacecraft"
Space Medal Cover, STS-2 Mission! Very rare! Limited Edition - only 3,000 produced! 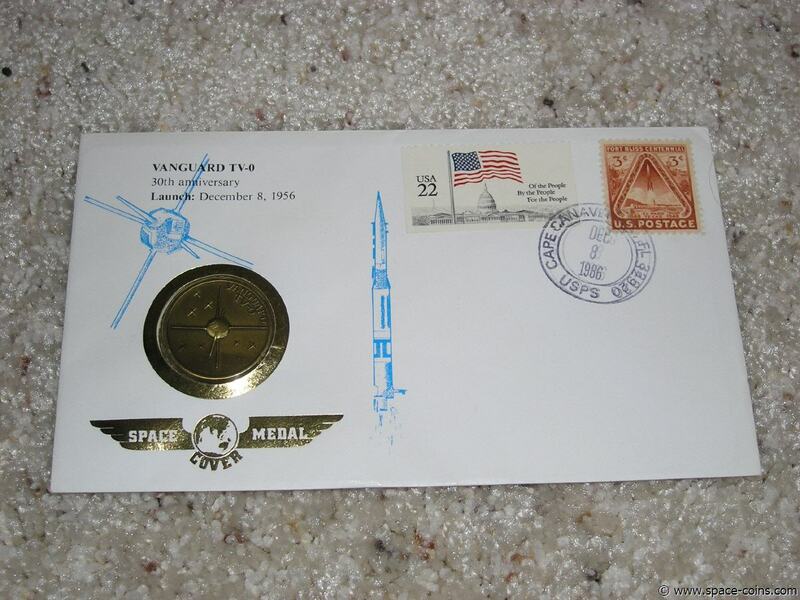 Space Medal Cover, Apollo 11 Mission! 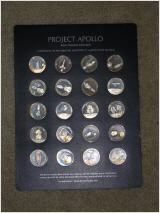 Space Medal Cover, Apollo 15 Mission! Very rare! Limited Edition - 2,000 produced! Space Medal Cover, STS-41G Mission! 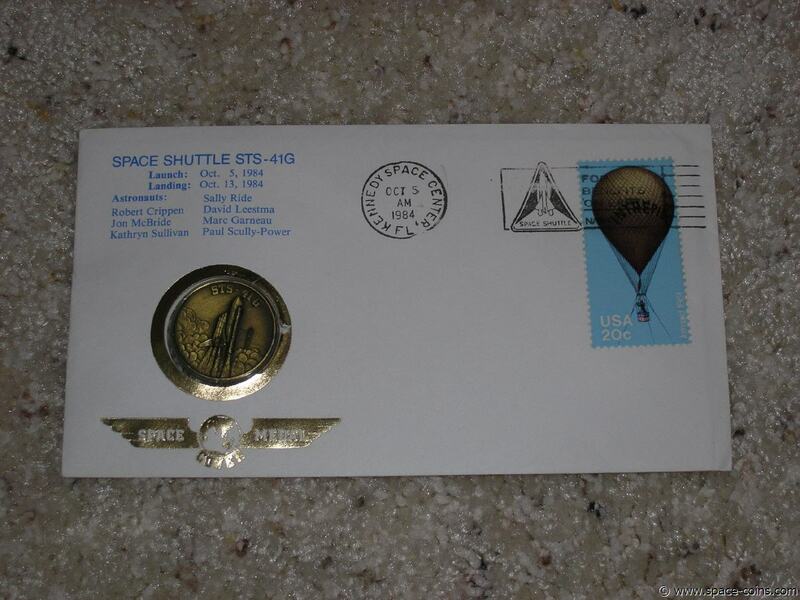 Space Medal Cover, STS-61C Mission! Very rare! Limited Edition -only 3,000 produced! 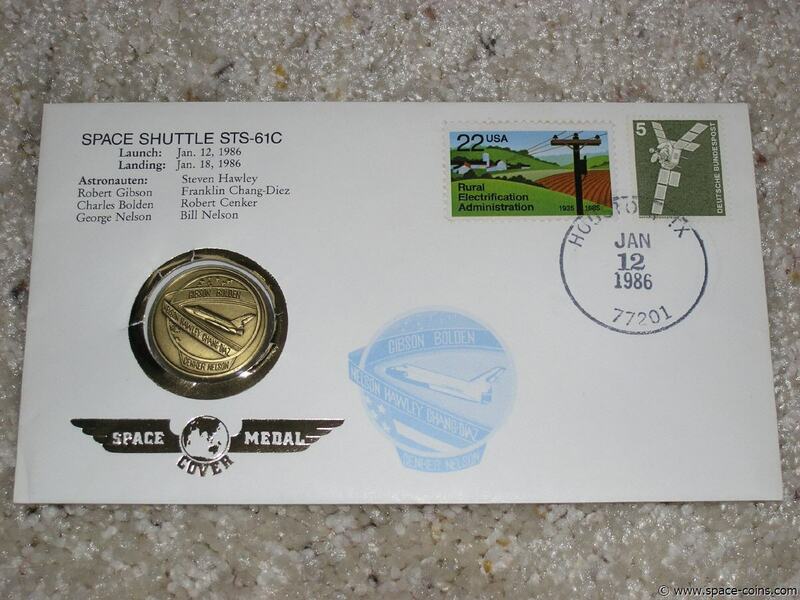 Space Medal Cover, STS-61A Mission! 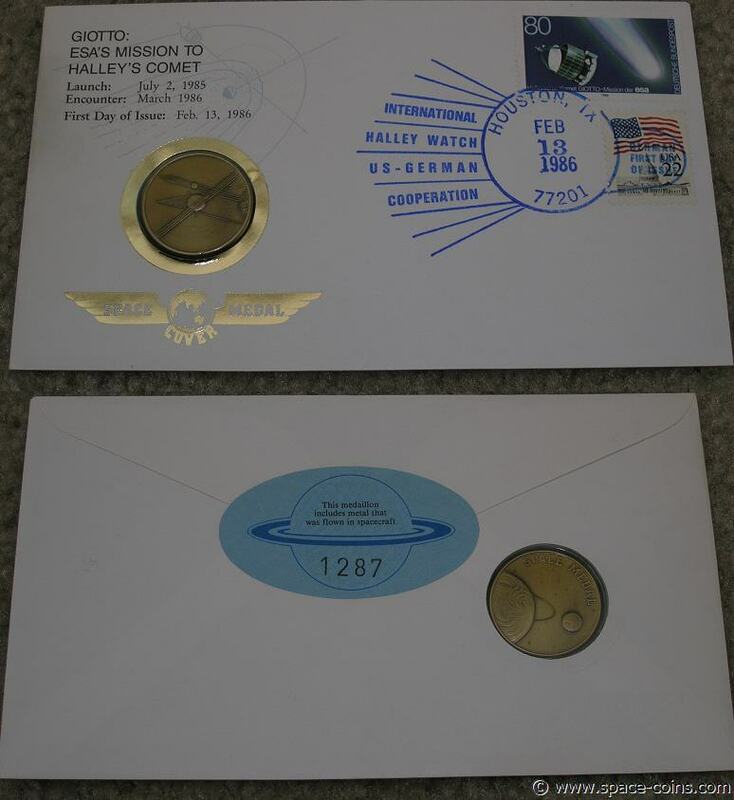 Space Medal Cover, Giotto / Halleys Comet Mission! Space Medal Cover, Ariane V22 Mission! Space Medal Cover, Ariane V25 Mission! Space Medal Cover, Ariane V26 Mission! Space Medal Cover, Vanguard Mission! Space Medal Cover, ALT Mission! Very rare! Limited Edition - 3,000 produced! Very rare! Limited Edition - only 2,000 to 3,000 each produced! 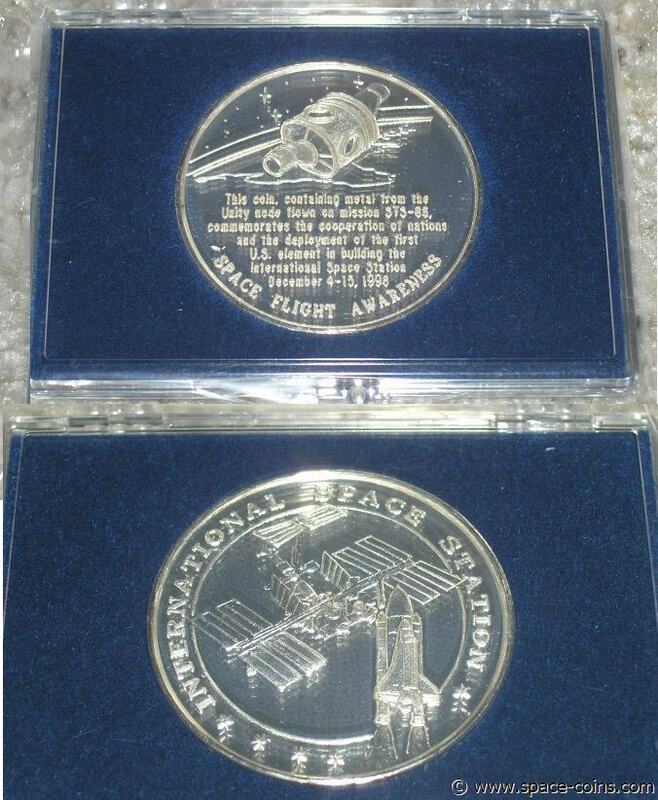 Space medals which contain space flown material! You are buying ONE medal !! 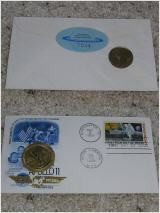 $9.95 stamp flown on Endeavour's Fall 1994 space flight! 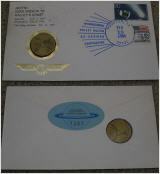 Mint Cover with beautiful vibrant artwork including the Earth, the Moon, an astronaut, starburst, and the space shuttle. Rear of envelope: "Produced by the United States Postal Service in association with the National Aeronautics and Space Administration , Cover Art by Keith Birdsong"
Both moon landing stamps were designed by Paul and Chris Calle.